Hiʻilei Kawelo (Board President) was born in Kailua, but credits her upbringing to her Kawelo-Ching ʻohana of Kahaluʻu, Oʻahu. Her passion is Hawaiʻi, our people, our practices and our land and sea. Hiʻilei currently serves as the Executive Director of Paepae o Heʻeia, a small non-profit that cares for an 88-acre traditional Hawaiian fishpond, Heʻeia Fishpond. She feels very fortunate to be employed by a non-profit organization that allows her to effectuate others through her passion. Her practice is that of a wahine lawaiʻa (fisherwoman), specific to the Kāneʻohe Bay area. Her family’s dependence on the Bay for sustenance has led her to where she is today. 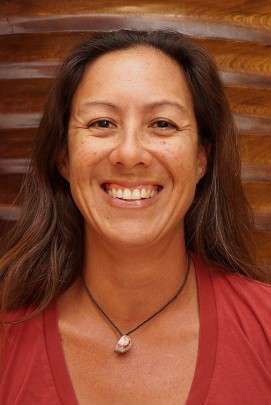 A 1995 graduate of Punahou School, Hiʻilei received a Bachelor of Arts degree in Zoology and certificate in the Marine Options Program from the University of Hawaiʻi at Mānoa. After graduating from UH, she worked at the Oceanic Institute (OI) for five years in the Fisheries and Environmental Sciences Program/ Stock Enhancement Program. Hiʻilei later left OI because of exciting momentum and opportunities to engage the community through the fishpond, which then led to the creation of the non-profit Paepae o Heʻeia in 2001. The Heʻeia ahupuaʻa may well be one of the few ahupuaʻa on the island of Oʻahu where the connection between land and sea is still maintained and is actively being restored. Paepae o Heʻeia’s work at the fishpond relies on the work of others in the ahupuaʻa such as Papahana Kuaola and Kākoʻo Ōiwi. These are truly exciting times and she is extremely honored to be a part of them.